(CNN) -- President Barack Obama has accomplished some extraordinary things but can he really shoot down a fighter jet? The F-22 Raptor is the most expensive jet fighter ever built. The plane is the F-22 Raptor, a supersonic stealth marvel that looks like it's flown straight out of a Hollywood action film. It is being built for the U.S. Air Force, boasting the most advanced technology in the sky. 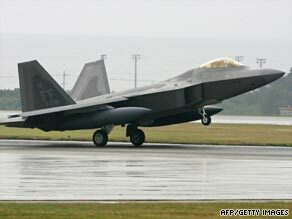 "You talk to any aviator in the world, ask what they would like to fly, and if they don't say the F-22 then they are lying," U.S. Major Derek Routt told The Atlantic magazine. "I would kill to fly it." The U.S. government has ordered nearly 200 of them, even as the price has rocketed to more than $350 million each, making the Lockheed Martin/Boeing F-22 the most expensive fighter ever built. But it's never been used in combat and it's not clear when it will be. The U.S. simply doesn't face any enemies with planes advanced enough to bother sending out an F-22. "The reality is we are fighting two wars, in Iraq and Afghanistan," Defense Secretary Robert Gates said, "and the F-22 has not performed a single mission in either theater." But it's the U.S. Congress that actually funds the military. A lot of its members want to see more F-22s taking off, to keep the U.S. air force ahead of potential rivals and protect thousands of factory jobs across the country. "We need to maintain that air superiority," said Congressman Phil Gingrey, whose district is home to the main F-22 assembly line. "This is not just about 2,200 jobs, although with the economy as it is, and all these job losses, it's kind of preposterous to think that this administration would close (them) down." The Armed Services Committee of the House of Representatives has voted to order a dozen more planes. But the full Congress would still have to vote and Obama would have to sign the legislation. He says he will veto it instead. The president is taking aim at the F-22 but the fighter jet probably won't go down without a fight.